If games are a truly interactive medium, then it stands to reason that the people who play them have an unusual amount of influence on this creative form; more than they do on others. 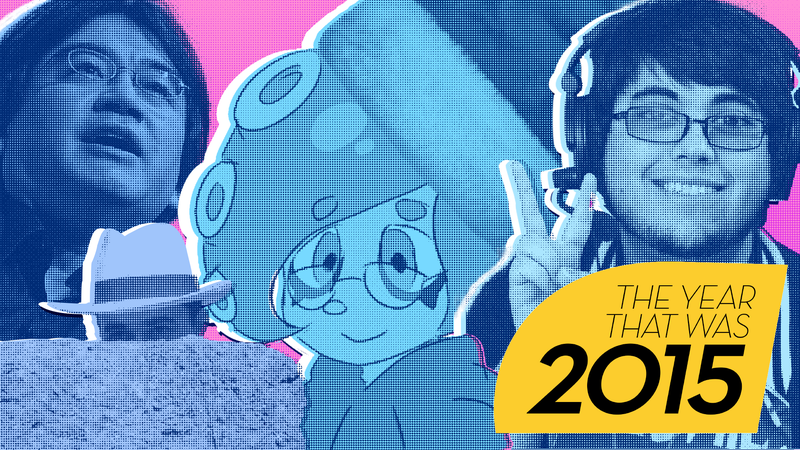 With that, we present, for the fourth year running, Kotaku’s Gamers of The Year. There were plenty of great gamers in the world of eSports this past year, including the dominant League of Legends team SKT, who rolled through November’s world championships. There were the members of Evil Geniuses, who topped the 2015 earnings list thanks to a clutch play that helped them with the $6 million Dota 2 International. We also have a soft spot for Street Fighter pro Infiltration, who didn’t win it all at Evo but still dazzled the crowd with his unusual character picks. But above all the others we had to go with Smash Bros. competitor Gonzalo “ZeRo” Barrios, who took a 53-tournament Super Smash Bros. Wii U win streak deep into the year before losing to rival Nairo. And then he kicked off another streak, which has lasted six tournaments and counting. No wonder someone put a bounty on his head. He’s really good! Data-miners, modders and hackers got so skilled this year that they were using data for a new Smash Bros. stage to recreate a playable version in an older Smash game before it was even playable for the new one. Wild. And this, basically, is the new normal. Sure, Rockstar Games might have planned a Grand Theft Auto Online Halloween “surprise”, but data-mining gamers will tell the world about it a couple of weeks early. Studios can try to confound the miners, of course. It’s all part of the game. Clearing Fallout 3’s hard mode on a single “true” health bar. Doing the same in Fallout New Vegas. Doing it through New Vegas and its DLC. The gaming exploits of YouTuber Many A True Nerd wowed us all year long. That isn’t to say we weren’t impressed by other adventurous gamers: We chronicled a few of them in our Compete series. And we marveled at the ingenious ways gamer Scott Buchanan exploits glitches to clear Super Mario 64 levels in ways humans shouldn’t be able to. We appreciated the loophole gamers on Twitch used to collectively beat Dark Souls in 43 days. We watched speedrun records fall. We loved it all and highlighted as much of it as we could. But time and again, MATN attempted the impossible—and time and again, he achieved it. We’re looking forward to seeing what he pulls off in Fallout 4 and beyond. Satoru Iwata was the cheerful face of the world’s most beloved video game company, the architect of Nintendo’s massive DS and Wii successes and the creator of games for HAL Laboratory. That’s a brilliant resume, but not one that’d get anyone on this particular list. And yet there was something about the late Iwata, who passed away in July. He was more than just a brilliant innovator, a smart businessman, or a sharp game creator. He played this stuff, and he delighted in it. In his knowing smile on each Nintendo Direct, and in his jovial Q&As in each new “Iwata Asks,” you could just tell: He was a gamer to the end and his passing touched seemingly everyone in the gaming community. RIP. Got your own picks for the Gamers of the Year? For the players who helped shape how we play, talk or think about games? Chime in below.